When I think of the word “brave”, I think of soldiers going off to war or people who do extreme sports like skydiving or cliff jumping or people in history who lived out their convictions in the face of adversity. But during this last mission trip to Vietnam, God let me in on a personal adventure with him, which gave me another perspective of what it means to be brave. Let me share the lyrics of the Bethel song “You make me brave” to express what I mean. When I heard about the Vietnam STM trip, something inside of me stirred and I knew I was supposed to be on the team. In addition, I also felt that I should also spend extra time going to Hanoi. But I do not know anyone there and did not have any definite plans. Still, I trusted that God would lead me and help me with making the right connections. As the time came closer to departure, it seemed like I still did not have any firm plans. When people would ask me what I was going to do, I couldn’t give them any specifics. 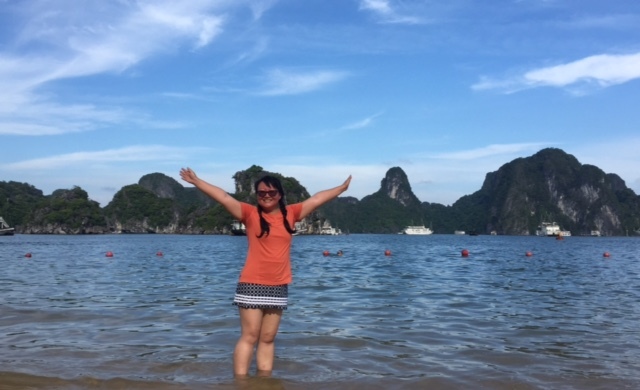 I had only one desire to visit Halong Bay, but hadn’t booked anything yet because I wanted to wait til I got there to decide. Basically, it sounded like I was going to wing it. And I was ok with that, as long as I had the basics in place: a place to stay and a way to get around. So, three days before I flew out, I finally secured lodging at a missionary house and some tentative plans to meet up with a few contacts that a friend gave…that was all I knew. Some people would be uneasy with the uncertainty, but I was beginning to sense this trip would be special. I knew God wanted me to go, so I trust He knows the plans, even if I don’t. I was relying on him to direct my path and to fill my itinerary. The other reason I have security was that I knew there were so many of my friends and supporters praying for me, I was covered. And even though I was traveling alone, I had the sense that God was with me and I was safe. And so step by step, things began to unfold, during my time in Hanoi. And I felt like God was my personal tour guide and as I take each step forward, He would prepare the next step, just in time. Day 1, when I landed at the airport, I got WhatsApp messages with instructions on how to get to the house I was staying at and who would be there to let me in. So, I would follow the instructions and even if I made a mistake and rang the wrong doorbell, I was still ok. And once I got settled in, I was starting to think about dinner and where I should go get a bite. But within a few minutes, the host family invited me to join them for dinner. What a blessing to share a home cooked meal with the young missionary family, with two little kids. After dinner, one of my contacts came and while getting to know her, she mentioned that she just got back from a missions trip and asked if I wanted to meet her teammates. I agreed and we went out to have milk tea as she introduced me to two of her friends, both seminary students. It was a divine appointment because one of them is also an interpreter for a local Bible School that trains pastors from minority ethnic groups and he goes to a local C&MA church! I’ve been praying to make local connections in Hanoi, so this was God’s answer. We prayed together and I was invited to visit the school and sit in on their class the next day. I was so thankful for these divine appointments. I accepted the fact that the rest of my trip would be being guided by the Holy Spirit on a day to day basis. Everyday was full of happy surprises and new adventures. So, the following morning, I took a Grab taxi to the address given, after which I would get a phone call from someone who met me on the main street, in order to walk me into the remote side streets where the school was located. Apparently some neighborhoods have narrow alleys that cannot be accessed by car, but only motorbike or on foot. It was quite an adventure…following the twists and turns, because I have a bad sense of direction, to the point that my friends joke that I get lost easily. When I sat in on the last class, it was on a topic that is very dear to my heart—missions. The teaching resonated with so many of my previous training and missions experiences, it moved me to tears. I felt overwhelmed that God orchestrated for me to be in a class that was equipping pastors to go back to their churches with the message of spreading the gospel, not only to their own people, but to reach other tribes, people and nations. I recalled countless prayer meetings with friends back home, when we would pray for God to raise up leaders among ethnic groups to preach the gospel. And there I was, sitting among the 52 graduating class of fellow believers, worshipping with them in Vietnamese and sharing in our God’s beautiful plan for the nations. I was overjoyed to be in my mother country, among passionate brothers and sisters, dedicated to fulfilling the Great Commission and seeing the nations worship Jesus. It is a profound moment that I will always remember. And so the rest of my trip was full of these amazing connections and divine appointments that only God could have planned for. They are too many to recount here, but feel free to ask me about them and I would be happy to share. I had opportunities to share my personal testimony with new friends from Canada, Malaysia, France, and Australia while touring Halong Bay. I recounted my life story and how this trip was coming back to my roots, coming full circle, seeing God’s plans are for good, not only for my family, but for the nations. Everywhere I went, I would pray blessings over the land and speak life and healing. And all along the way, eating amazing food, sipping Vietnamese coffee and having the time of my life! On every level, hands down, this trip has been the BEST trip I have ever taken, and I did not plan any of it! I experienced such freedom and joy as I simply surrendered my plans to His plans. And my Heavenly Father prepared the very best for me. As I prayed about what to share, it is my hope that this testimony paints a new picture of bravery, in the sense that when we know we are walking in God’s will, we can go and do things that are beyond ourselves. Jesus is still calling His disciples to “Follow me”. So, what is He calling you to do or where is He inviting you to go? For me, it was to go travel to a place alone without any set plans and trusting in His guidance. But for you, it could be to reach out to a coworker or neighbor and share your faith, or to do something that terrifies you, or an act of kindness at the spur of the moment, or to stand up for something that you believe in, or to take a risk and make a big change in your life. What is the Holy Spirit saying to you? Whatever it is, even if it is scary, I know He who calls you, will be with you every step of the way. He will make you brave.